The Grading Overview page provides a snapshot of your student's progress for a selected School Year, showing the year and term grades for each Subject/Course for your Student. You can get further detail on any selected Subject/Course by viewing the Grading Calculation page which shows how term grades have been calculated and can help you determine why a grade listed in a Report Card or Transcript is different than what you expected. 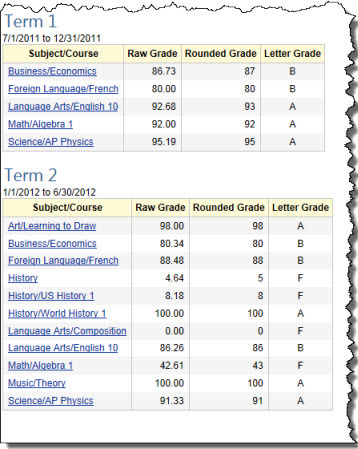 Grades are calculated based on your settings in the Grading Options section of the Customize menu. In order to generate a grade for an Assignment, the Points Possible value must be greater than zero and the Assignment must be marked as Teacher-Complete (has a check in the Teacher box of the Complete field). Checking the Complete - Student box does not generate a grade. For complete details on the grading options available in HSTOnline, please see the Grades Help Page. Note: For a Course using Weighted Grading, an entry for the Course will only appear on the Grading Overview page when there is at least one completed, graded Assignment for at least one of the weighted Activities within the Course. To access the Grading Overview area, click or touch Grading Overview under the Students section of the HSTOnline menu. On the HSTOnline menu, click or touch Grading Overview under the 'Students' section. On the Grading Overview page, select a Student and a School Year from the drop down lists and click or touch the Go button. You can click on the Subject/Course hyperlink in any Term table to move to the Grading Calculation page and view the details of how that grade was calculated. You have no Assignments for that Subject/Course in the Term. You have Assignments for that Subject/Course in the Term with Points Possible greater than zero, but none are marked as Complete - Teacher. You have Assignments for that Subject/Course in the Term marked as Complete - Teacher, but with zero Points Possible. You have Assignments for that Subject/Course in the Term graded and marked as Teacher-Complete, but the Course uses Weighted Grading and none of the completed, graded Assignments are tied to one of the weighted Activities for that Course. The HSTOnline Grading Calculation page shows you exactly how a grade was calculated, according to the options you have set in the Program Options: Grading menu. You can read more about the calculation methods available in HSTOnline in the Grades Help Page. In a Term table, click on a Subject/Course hyperlink to see the 'Grading Calculation' page for that item. Student: The name of the Student whose grades you are viewing. Term: The start/end dates of the Term for which you are viewing grades. Subject/Course: The name of the Subject or Subject/Course for which you are viewing grades. Click or touch anywhere on the screen to hide the pop-up. Term Grade: The rounded percentage grade and letter grade earned for the Subject/Course for the Term, followed by the name of the Grading Scale in use for this Subject or Subject/Course. The rounding of the Term grade to a whole number or to one or two decimal places is determined by your settings in the Grading area of the HSTOnline Program Options. Click or touch the information icon next to the Term grade to view a summary of how the grade was calculated. See the Calculation sections below for specifics. 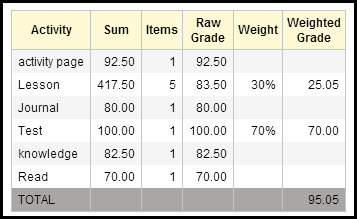 Click or touch the information icon next to the Grading Scale name to see the details of the Grading Scale. Click or touch anywhere on the screen to hide the Summary or Grading Scale details pop-ups. Add: Add one or more Assignments list. This action is always available. Edit: With one Assignment selected, this action becomes available. Choose edit to change any aspect of the selected Assignment. Multi-Edit: With two or more Assignments selected, this action becomes available. Choose this option to edit the same information for the selected items. Delete: With one or more Assignments selected, this option becomes available. Choose this option to permanently delete the selected items from your database. Choose Columns: Click or touch this option to select which fields will be displayed in the Assignments list. You must select at least one column. 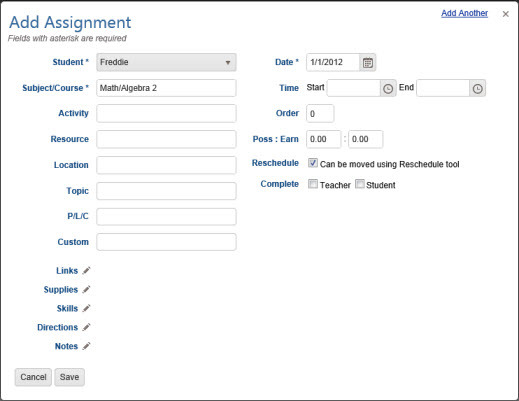 Filter: Click or touch this option to select which types of Assignments will be displayed. The default filter settings will display those items which have a check in the Teacher Complete box and those which have a check in both the Teacher and Student Complete boxes as these are the only items that are considered when generating a grade for your Subject/Course. Incomplete: Choose this option to show items which are not yet marked as Complete by Student or by Teacher. Complete - Teacher: Choose this option to show items which have a checkmark in the Teacher box but not in the Student box. Complete - Student: Choose this option to show items which have a checkmark in the Student box but not in the Teacher box. This option is only available if the 'Complete by Student' field is enable in Program Options. Complete - Teacher and Student: Choose this option to show items which have a checkmark in both the Teacher box and the Student box. This option is only available if the 'Complete by Student' field is enable in Program Options. 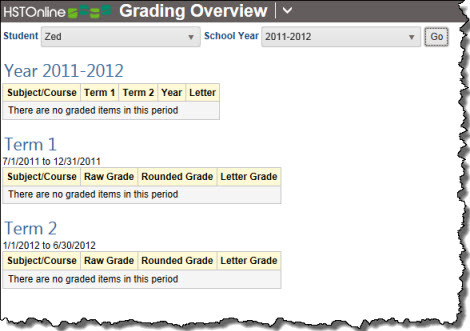 Return to Grading Overview: Click or touch this button to return to the year/term view of the Grading Overview. Search Box and Go Button: Use the Search box to enter text and click the Go button to find Assignments matching your entry. HSTOnline will do an exact search for whatever text you enter within the Activity, Resource, Topic, PLC, Custom, Directions (Preview) and Notes (Preview) fields. Leave the search box blank and click Go or click or touch the Search text badge to return to the full list of Assignments. Viewing: Indicates the number of Assignments being displayed out of the total for the term, based on the current filter settings. Select All: Click or touch this badge to quickly select all the Assignments in the list. Selected: When one or more Assignments are highlighted, this badge will appear to show the number items selected. Click or touch this badge to deselect all Assignments. Filter Settings: The filter badge will appear showing the types of items being displayed: Incomplete, Complete - Teacher, Complete - Student, and/or Complete - Teacher and Student. Search text: Shows the text entered into the Search box which is limiting which Assignments are displayed. Click or touch this badge to clear the text from the search box and remove that limitation. While in the Grading Calculation page, you can click on the information icon next to the Term grade to see the details of how that grade is being calculated. Below, we provide an explanation of each type of grading calculation. This calculation method is the 'traditional' way of figuring a grade. A percentage grade is figured for each individual Assignment by dividing the points earned by the points possible. To create a Term grade, all of those percentages are added together and the sum is divided by the total number of graded Assignments for the Subject/Course for the Term. For a more thorough explanation, please refer to the Grades Help Page. Activity: In a non-weighted Course, the grades for Assignments of all Activities are added together, so the column shows 'All'. Sum: The total of all the percentage grades for all Teacher-Complete and Teacher and Student-Complete Assignments in the Term. Items: The number of completed, graded Assignments in the Term. To be considered Completed, the Assignment must have a check in the Teacher-Complete box. To be graded, the item must be marked as Teacher-Complete and have a Points Possible value greater than zero. Raw Grade: This number comes from dividing the Sum column by the Items column. Raw grades are rounded to the hundredths place (2 decimal places). Weight: This is always 100% in a non-weighted course. For information on weighted courses, see below. Weighted Grade: This number comes from the Raw Grade multiplied by the Weight. In a non-weighted Course this will be the same as the Raw Grade. This calculation method figures a Term grade by taking the Sum of all the Points Earned for all completed Assignments and dividing by the Sum of all the Points Possible for those items. For a more thorough explanation, please refer to the Grades Help Page. Earned: The total of all Points Earned for all Teacher-Complete and Teacher and Student-Complete Assignments in the Term. Possible: The total of all Points Possible for all Teacher-Complete and Teacher and Student-Complete Assignments in the Term. Raw Grade: This number comes from the Earned column divided by the Possible column. Raw grades are rounded to the hundredths place (2 decimal places). Weighted Grade: This number comes from the Raw Grade multiplied by the Weight for the Activity. In a non-weighted Course this will be the same as the Raw Grade. When a Course is set for Weighted Grading, your selected Grading Calculation method is performed at the Activity level. The calculated grade for each Activity is multiplied by the weight you have set. Those values for each Activity are then added together to come up with a final grade for the Term. For a more thorough explanation of weighted grading, please refer to the Weighted Grading Help Page. Activity: Each Activity is listed in an individual row. Sum: The total of all the percentage grades for Teacher-Complete and Teacher and Student-Complete Assignments in the Term for each Activity. Items: The number of completed, graded Assignments in the Term for each Activity. To be considered Completed, the Assignment must have a check in the Teacher-Complete box. To be graded, the item must be marked as Teacher-Complete and have a Points Possible value greater than zero. Raw Grade: This number comes from the Sum column divided by the Items column for each Activity. Raw grades are rounded to the hundredths place (2 decimal places). Weight: The weight you have assigned to each Activity is displayed in this column. Weighted Grade: This number comes from the Raw Grade multiplied by the Weight. Total: All the values in the Weighted Grade column are added together to come up with the overall raw weighted grade for the term. Earned: The total of all Points Earned for all Teacher-Complete and Teacher and Student-Complete Assignments in the Term for each Activity. Possible: The total of all Points Possible for all Teacher-Complete and Teacher and Student-Complete Assignments in the Term for each Activity. Raw Grade: This number comes from the Earned column divided by the Possible column for each Activity. Raw grades are rounded to the hundredths place (2 decimal places). you have a Course with weighted Activities of Lesson (30%) and Test (70%). but there are no completed, graded Assignments for the Activities of Lesson or Test. no entry will appear on the Grading Overview Term table. Once there is at least one completed, graded Assignment for one of the weighted Activities, the Summary table for a Weighted Course will show an Activity row for any Activity that has at least one completed, graded Assignment - whether that Activity is weighted or not. This information is included for your review, but grades for non-weighted Activities will not be included in the Weighted Grade calculation. Since the weight for those Activities is zero, multiplying any raw grade for those Activities times zero gives a result of zero. To simplify the display, those cells are left blank. You can choose to edit any of the Assignments in non-weighted Activities to change to a weighted Activity and have those grades count towards the overall grade. Or you can choose to adjust the weighted grading to incorporate the additional Activities. 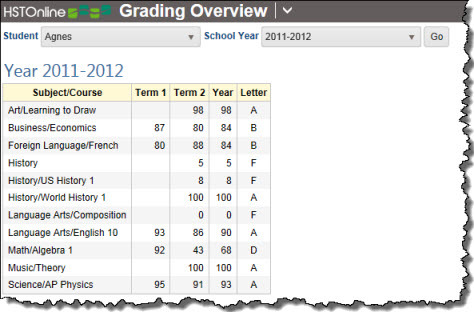 When a Weighted Activity has no completed, graded Assignments, it will adversely affect the grade by the missing weight. The Summary will show whatever grading information is available for weighted Activities which have completed, graded Assignments. You can check the weighting information for the Course by clicking on the information icon next to the Subject/Course name in the header area. You can see that there are grades for two weighted activities - Lesson and Test - but the total weight accounted for is only 65% of the overall: 15% for Lesson Activity, and 50% for the Test Activity. Click on the information icon next to Math/Algebra 2 to get the details of the weighted Activities for this Course so you know what's missing: Quiz (25%) and Review (10%). Adjust the Weighted Grading for the Course. On the Grading Calculation page, you can view the Assignments used to generate the grade for the selected Subject/Course for the Term. The default view will show you all Assignments for the Subject/Course and Term which have been marked as Complete - Teacher or Complete Teacher and Student. You can use the Filter to also show the Complete - Student and/or Incomplete items. Assignments which are part of the grading calculation will show a percentage value in the Grade column. These are items which have a Points Possible (Poss) value greater than zero and which are marked as Complete - Teacher. Items which do not meet one of these criteria will be blank in the Grade field. You can use the Action button to add additional assignments to this list or to edit, multi-edit or delete any one or more of the existing Assignments. Added or edited Assignments will also appear in the Agenda - Calendar View and Agenda - List View. If you change the Student and/or Subject/Course for any of the existing Assignments or choose a date outside of the Term being viewed, those items will fall off the list when the screen is refreshed as they will no longer meet the parameters for the Student, Term, and Subject/Course being viewed. 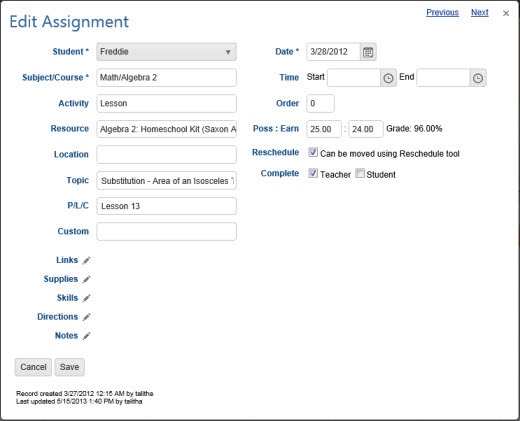 On the Grading Calculation page, click or touch the Action button and select Add to open the Add Assignment form. Fill in whatever additional information is needed. For the Activity, Resource and Location fields, press the space bar to see all the options for those fields, begin typing to see items with those letters, or create a new entry. See the Smart-Entry Fields Help Page for more details. If you are working with Course with weighted grading, be sure to select a weighted Activity for this item. To create a graded item, enter points into the Poss and Earn fields and check the Teacher box in the Complete field. Cancel to abandon the new Assignment without adding to your list. Save to add this Assignment to the list. The 'Add Another' hyperlink in the top right corner to save this Assignment and add another. You can click 'Add Another' each time until you have entered the last new Assignment and then click the Save button to end the Add process. Both the Grading Calculation and the Assignment list will be refreshed to reflect the new additions. On the Grading Calculation page, double-click on the item you want to change to open the Edit Assignment window. Alternatively, you can click once on the item you want to change and then click the Action button and choose Edit to open the Edit Assignment window. On a touch device, touch the item you wish to edit and then touch the Action button and touch Edit to open the Edit Assignment window. Make whatever changes are needed to the Assignment. If you change the Student and/or Subject/Course or choose a date outside of the Term being viewed, the edited Assignment will fall off the list when the screen is refreshed as they will no longer meet the parameters for the Student, Term, and Subject/Course being viewed. Cancel to abandon the changes and close the Edit Assignment window. Save to commit the changes to your Assignment and close the Edit Assignment window. Click or touch the Previous or Next hyperlink in the top right corner to save your changes to this Assignment and move to the previous or next Assignment in the list. You can click or touch Previous or Next until you have made all the changes you want to your Assignments and then click the Save button to end the Edit process. If you reach the beginning or end of the list when clicking or touching Previous or Next, the Edit window will close and you will be returned to the list view. Both the Grading Calculation and the Assignment list will be refreshed to reflect the changes you have made. When using Multi-Edit, you have the opportunity to change the same information for two or more items at the same time. When you select a field in the Multi-Edit window by putting a checkmark to the left of the field name, make your changes and click the Save button, whatever information or blank space that is in a checked field will be transferred to the selected items, replacing whatever data was previously in those fields. On the Grading Calculation page, select the items you want to change. You can use the Grouping and Sorting, Filter and Search features to isolate the items you want to change. Click the checkbox for each Assignment you want to change. You can use your mouse to click and drag over contiguous Assignments in the list to select those items. On a touch device, you can touch and drag your finger over contiguous Assignments in the list to select those items. Click or touch the 'Select All' badge to select all the Assignments in the list. Click or touch the Action button and click or touch Multi-Edit to open the Multi-Edit Assignments window. The fields in the Multi-Edit window will show the settings for the first Assignment in your selection. Click or touch the box to the left of each field you want to change for all selected Assignments. Make your selection for each of those fields. If you change the Subject/Course for any of the existing Assignments or choose a date outside of the Term being viewed, those items will fall off the list when the screen is refreshed as they will no longer meet the parameters for the Student, Term, and Subject/Course being viewed. Cancel to abandon the changes and close the Multi-Edit Assignments window. Save to commit the changes and close the Multi-Edit Assignments window. If you have elected to change the Subject/Course for these items, you will get a message warning you of the change you are about to make. Click or touch 'Never Mind' to cancel the change and be returned to the Multi-Edit window; click or touch 'Yes, I'm Sure' to make the change to the selected items. 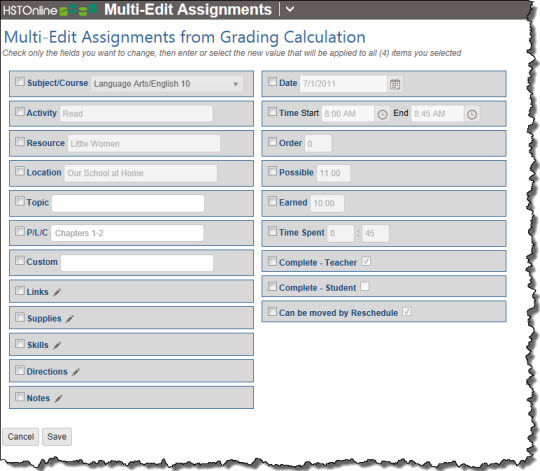 You can select any one or more Assignments in the Grading Calculation page to completely remove them from your database. Deleted items cannot be retrieved. Click the checkbox for each Assignment you want to remove. Click or touch the Action button and choose Delete. 'Yes, I'm Sure' to complete the deletion process. HSTOnline will delete all of the selected Assignments from the database.